WESTWORLD PHOTOS: 1x08 "Trace Decay"
HBO has provided us with a new collection of photos from Sunday’s “Trace Decay” (also, don’t forget to check back here for our usual post episode/embargoed additions on Monday morning). However the gallery, just like the log lines for the upcoming hour, are a little on the inscrutable side. Perhaps it’s not too surprising, given we’re just 2 episodes from the end of the first season, and we’ve just witnessed a massive reveal in the form of Bernard’s (Jeffrey Wright) true nature. Is Host Bernard based on Arnold? We’re still convinced there’s something linking the lab host to the park’s original co-creator, but at this stage it’s hard to tell what that connection is. HBO teases that “Trace Decay” will see Bernard struggling with a mandate. 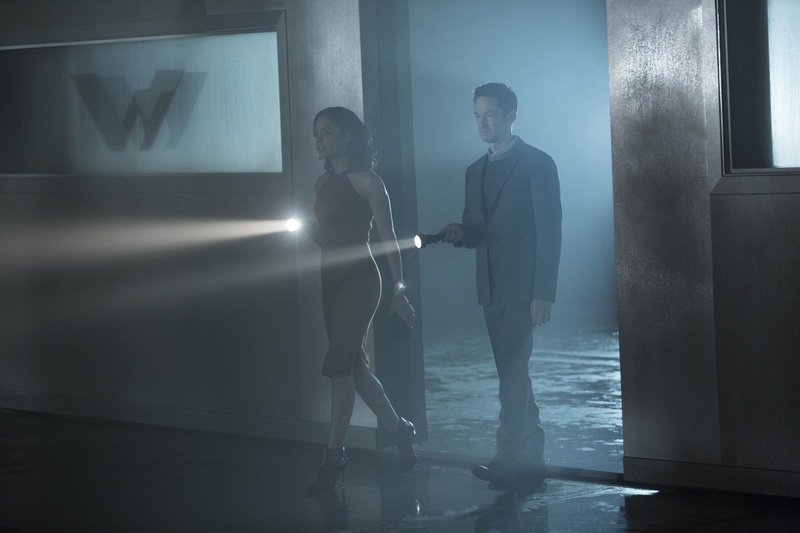 Meanwhile Maeve (Thandie Newton) looks to change her script and Teddy (James Marsden) is jarred by dark memories from a previous incarnation. Teddy’s journey is also interesting. At first glance he seems to be nothing more than a tag-a-long for the Man in Black, or a means to enter the maze via Sweetwater’s most amenable tour guide. But those flashbacks imply Teddy wasn’t always the goodhearted hero, and we’re kind of intrigued to think the finale may turn both heroes and villains on their heads. The “Trace Decay” episode of Westworld airs Sunday, November 20 (9:00-10:00 p.m.) on HBO. Follow @ScreenSpy on Twitter | ScreenSpy on Facebook for more Westworld scoop.